Sweet January, how fast have you passed – it’s crazy! How has 2017 started for you? We are about to go and visit our friends who recently became new parents, to a sweet baby girl. 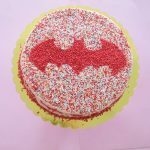 All new parents need an energy boost and while sugar might not be the healthiest it surely makes a sweet one 🙂 This cake was inspired by the little batgirl that we are super excited to meet! 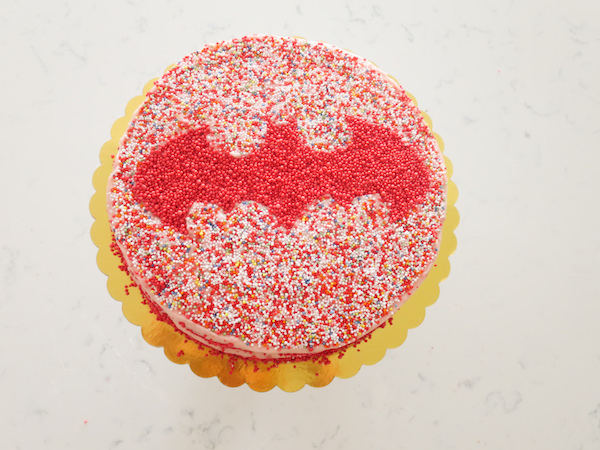 The cake has a vanilla confetti sponge with vanilla three ways and it’s filled and covered in strawberry buttercream frosting made with fresh strawberries and it’s decorated with red sugar sprinkles batman logo and multicoloured sugar sprinkles. 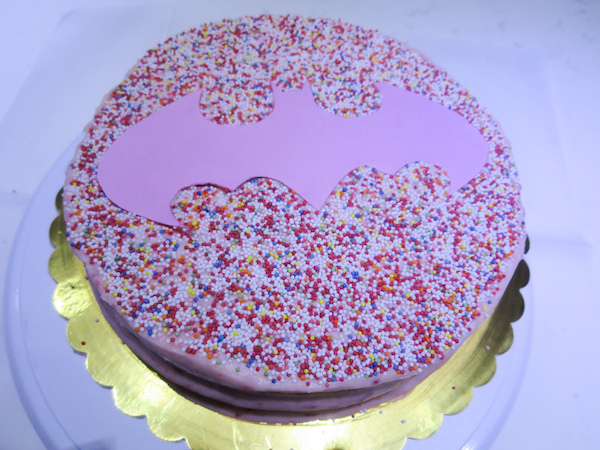 Preheat oven to 160ºC (320ºF) , lightly grease two 20cm (7.8 inch) cake tins and line with parchment paper. Place butter and sugar in a mixing bowl and start beating on medium high speed for few minutes. Add eggs one at time, mixing for a minute in between. In separate bowl combine self rising flour, vanilla bean seeds and corn flour and sift. In two additions add the flour mixture and liquids to the mixer and mix only until incorporated and smooth. Remove from mixer and fold in the sprinkles by using a spatula. Pour into cake tins and bake in preheated oven for about 25 minutes, until a tooth pick inserted in middle comes out clean. Lift onto a wire rack and allow to cool. Mash strawberries with a fork or pulse couple times in a blender. 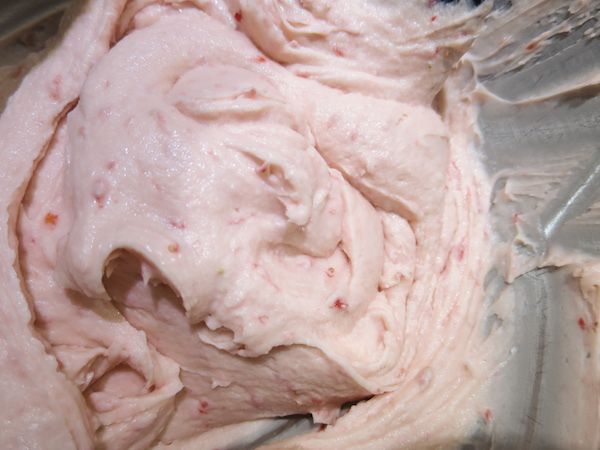 Place butter and half of the powdered sugar in a mixing bowl and add mashed strawberries, milk and vanilla, then start mixing with a flat beater on medium speed. Add remaining sugar and continue to beat gradually increasing the speed, mixing until smooth and desired consistency. Add some more powdered sugar if needed. Level the cakes to ensure they'll sit on each other straight. Place some frosting on a serving plate and place cake on top, spoon generous amount of frosting on top and place the second cake on top to make into a sandwich. Coat with frosting and smoothen by using a paletta knife. Then if using a picture/logo place a paper cutout on top gently pushing it to the frosting so that sprinkles won't go under. 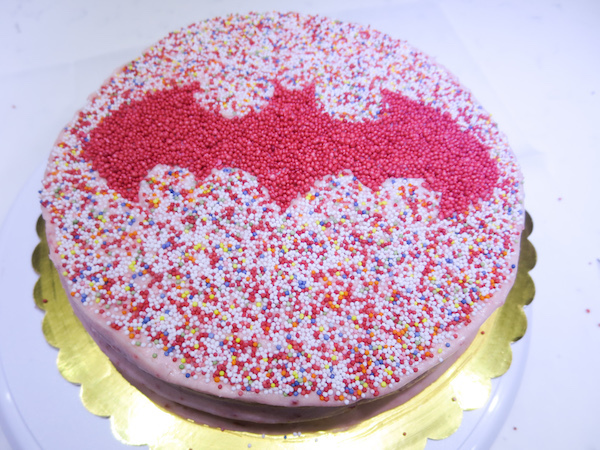 Cover with multicoloured sprinkles gently pushing them into the frosting. 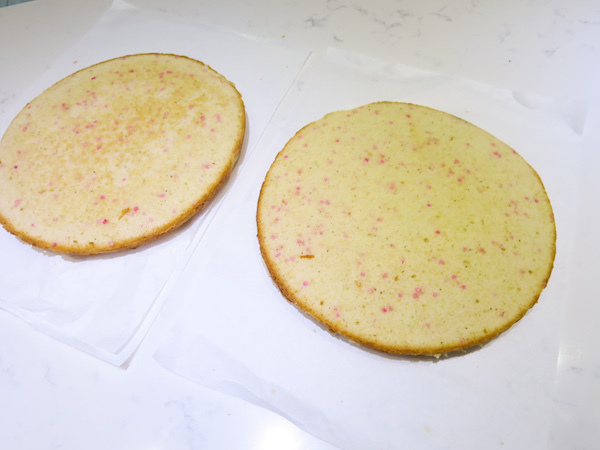 If you choose to cover sides work with a handful of sprinkles at time and pressing from sides. 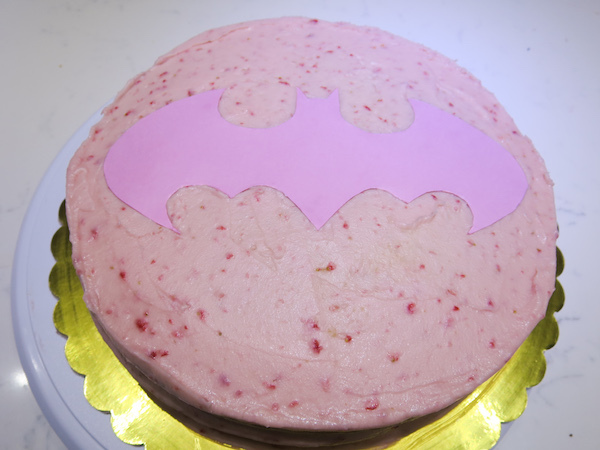 Remove the paper cutout by gently pulling it, then cover the area with red sprinkles. Decorate sides as you wish and serve chilled.